I picked a few more tomatoes today and also grabbed a couple red jalapeno peppers. So, it occurred to me to make some salsa! Duh! I haven't had a clue what to do with the peppers and I'm running out of tomato ideas, so there ya go: salsa. Mix together in bowl, check spices, chill. Last night I made spaghetti. It turned out pretty good. I winged it and did not follow a recipe, but i sort of followed my grandmas recipe from memory. 2 cups stewed tomatoes (mine were fresh from my garden! :) or a 15 oz can. Saute vegetables in until soft, about 10-15 mintes. Add remaining ingredients (except for the sausages), bring to a boil, turn to low, and simmer for about 2 hours. Add more water if needed, check frequently for spices. Add the sausages the last 30-45 minutes. Yield: 8 servings. 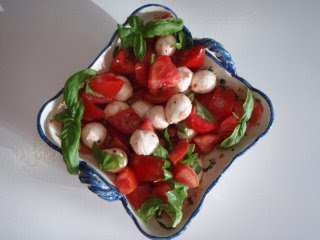 I made a beautiful Caprese salad with more tomatoes from my garden. I chopped up 4 medium tomatoes, threw in some pearl mozzarella, torn basil (from my window garden), freshly ground salt & pepper, a drizzle of extra virgin olive oil, and some red wine vinegar. Its all marrying together in the fridge, so in about an hour it will be perfect. Its also good at room temperature. I had a ton of ripe tomatoes from my garden that I needed to do something with, so I decided against canning, but rather to stew them. I'd never stewed tomatoes before--it was really easy and I'll do it again, I'm sure. I didn't follow a recipe, just common sense. First, you boil some water then drop in a few tomatoes at a time. Leave in until the skin bursts (I scored the "belly button" first), remove with a slotted spoon and put in a bowl filled with cold water until they are cool enough to peel. Meanwhile, in a large pot, saute some bell peppers & onion in butter until soft. Hand crush the peeled tomatoes into the pot, add some salt, pepper, a little bit of sugar, some basil, & a few bay leaves. Bring to a boil; simmer for about 2 hours, covered. Remove bay leaves, let tomatoes cool, then transfer to quart size freezer ZipLocks and store in freezer until needed for your next recipe that calls for stewed tomatoes. I saw this recipe on Crockpot Lady's blog and knew I had to make it. I ended up modifying it quite bit, though. I did not use the crock pot, so I mostly followed the recipe on Recipe Zaar by Nonnie4Two. I used yellow onions instead of green, and I omitted the Velveeta for two reasons: one, I didn't have any and two, it just seemed wrong to me. Theres no cheese in Buffalo wings! If anything, I'd sprinkle some bleu cheese crumbles on the top next time. Add remaining ingredients and simmer, stirring occasionally, until cheese has melted. This soup was really good. I mixed in some Sriacha sauce with the wing sauce for a bigger kick and I had marinated the chicken in the same mixture first. Of course, I tossed out the sauce that the chicken was cooked in (that would have been gross and something my husband would have done) and added fresh sauce to the actual soup. Like I said, some bleu cheese crumbles would have been good. I'll have to get some for the leftovers. I think we're going out to dinner tonight, so I'll do a review next. And hopefully, I'll have some race training details to add....since my race is in 14 days! I bought some soba noodles the other day and I wasn't sure what I was going to do with them, but I found an interesting recipe by Guy Fieri. I love Guy. He's Money! I absolutely love his restaurant, Tex Wasabi up in Santa Rosa (he has one in Sacramento, too). Anyway, this recipe turned out really good. I give Guy the credit, but I didn't follow it exactly. As for the veggies, I ommitted the napa cabbage (I used red cabbage instead), bean sprouts, & bok choy, simply because I didn't have them on hand. I would kick it up a little bit next time and add some red chili pepper flakes. I also used Ponzu flavored soy sauce instead of regular. I hope by giving Guy the credit, its ok for me to post it here...? In a medium stock pot, boil water, add salt and cook noodles. When finished, place noodles in an ice water bath to cool. Drain and set aside. In a medium bowl combine, sesame oil, vinegar, soy sauce, hot chili oil, hoisin and extra-virgin olive oil. Mix thoroughly and then combine prepared vegetables and noodles. Garnish with sesame seeds and peanuts." I did not use peanuts, and I would let it chill for an hour or two next time, so that the flavors have a chance to marry. I didn't take pictures. I'm trying to remember to do that. I think this salad would go amazingly with Guy's Wasabi Sake-Tini!!! He puts powdered wasabi on the rim of the glass, mixes vodka & sake, and garnishes it with a pickled ginger stuffed olive. OMG! Yum! Guy, can you feel my love? Tomorrow I'm going to make the Buffalo Chicken Soup that Stef at 365 Days of CrockPotting posted a few days ago. I marinated the chicken in the buffalo sauce before I baked the chicken tonight. I would have made it today, but I'm out of Velveeta. Well, its just not something I always have on hand. What can I say? But God, this soup...it looks so good!!! Can't wait to try it. I had defrosted some ground beef, some sweet Italian pork sausage, and some spicy "Caprese" (?) Italian sausage, so I decided to go ahead and make a meat loaf. Its been a very, very, very looooong time since I've made meat loaf. The main reason being that my kids don't like it...actually, they just don't really like meat very much. Its getting exhausting trying to get them to eat what I make. Anyway, I followed Elises' recipe from her website, Simply Recipes. Love that site, btw. I was out of carrots & celery, so omitted that and the butter, and I am out of bread crumbs, so I smashed up some stoned wheat crackers. Funny name, but thats what they are called. LOL. The goulash turned out really good. I had a bunch of mushrooms so I added those in for the heck of it and also to make up for the fact that I didn't have enough tri tip. I made a gorgeous cucumber salad, too, which turned out good. The Basil-Lemon sorbet? No so good. It was just way too sweet! And I cut the sugar from 2 cups to 1 and 3/4!! The basil was weird, but interesting. I should have used more mint, too. I am tripping out on how Twitter works. I mean, I get it, but I see something that sparks my interest and I try to follow the "conversation", but can't. Its kind of frustrating. There was some buzz about someone being on some talk show and I was finally, after lots of searching, finally able to figure out that a few of my favorite food bloggers are going to be on Martha Stewart on Wednesday. How fun! I'll have to tape it. I'm making Hungarian Goulash for dinner tonight. I wanted to try to do it in the crock pot, but I don't think I have time. I suppose I could do it anyway and have it for dinner tomorrow night, instead. But then what will be for dinner tonight? I'm obviously craving some comfort food! Because meatloaf sounds good, too, but no one else in my family will eat it. You know what else they won't eat which makes me mad? Manwiches....or Sloppy Joes, whatever. Who doesn't love a Sloppy Joe? I made the best Tiramisu yesterday! Its the first time I made it and well, it turns out that I'm really good at it! LOL You just beat together 3 egg yolks, 1/2 cup of sugar, 1 TBSP strong coffee or espresso, & 2 TBSP brandy or cognac for about 3 minutes. Fold in 8 ozs Mascarpone cheese and beat for about 4 minutes until smooth & creamy. Then in a separate bowl, you whip 3 egg whites & a apinch of sugar until it forms soft peaks. Dip the bottom half of 10-12 lady fingers into espresso or coffee, then layer the cheese mixture on top, sprinkle some cocoa powder ( I used Green & Blacks organic), keep layering, and Well-a! Tiramisu! My kids complained that it was too wet on the bottom, but I think its perfectly delicious and my husband agrees. I put the freezer barrel in the freezer two days ago so I guess I ought to get busy and make that Basil Lemon Sorbet I've been meaning to make. Doesn't that sound good? It has mint in it, too. Yum.